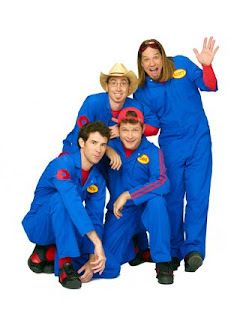 My kids are so excited (okay, maybe my daughter is a little more excited than my son), the Imagination Movers are coming to the Akron Civic Theater for two shows on Friday, March 25th. In fact, we were at the Akron Civic Theater last weekend for the Cuyahoga Valley Youth Ballet performance of Madeline at the Circus and when we walked in, there was a large stand-up of the Imagination Movers in the theater with show information. My daughter posed with the stand-up to get a picture. We went and saw the Imagination Movers about 15 months ago on their last tour and it was an amazing experience. When the theater went dark and the announcer was introducing them, even I got the chills. In no time, the kids were up and dancing in the aisles - it was their first "concert" experience and based on their smiles and the amount that they talked about the show afterwards, I would say that they thoroughly enjoyed themselves. Their live show, at least last time we saw them, was structured very similar to their television show - they sang, they solved a problem and had a good time. I have shared before about the Imagination Movers and how much I enjoy their show and their music. I like that they work their way through a problem solution - I think it is a great way to show kids that sometimes (in the case of the Movers, most of the time) the first solution you come up with may not be the right one and you need to try again to solve the problem. Their songs are catchy tunes that I frequently find myself singing along too. In fact, I have, in a state of distraction, found myself a few miles down the road from dropping the kids off at school, still singing along to the Movers, not having changed back to "my" music. They have a number of songs that I enjoy, and I'm not sure that I could come up with just one. I would say my daughter's favorite right now is First Day of School and my son's is Playing Catch. Disney's Imagination Movers Live! In a Big Warehouse Tour with special guest Choo Choo Soul. You can purchase tickets for the show at the Akron Civic Theater here. I have the opportunity to giveaway a family four pack of tickets to the 4 pm show on Friday, March 25th, courtesy of the Akron Civic Theater. To enter: Leave a comment sharing which Imagination Mover is your child's favorite. Share with your friends on Facebook, Twitter or your blog. Come back and leave a comment telling us how you shared, be sure to include a link. Leave a comment sharing which Imagination Mover song is your favorite. The giveaway will remain open until Saturday, March 19th at 2 pm! The winner will be selected using a random number generator and will be contacted by e-mail (please be sure to leave an e-mail) and will have 24 hours to respond or a new winner will be selected. No compensation was received for this post. My family purchased our own tickets for the show that we are attending. The Akron Civic Theater team provided a four pack of tickets for this giveaway. Smitty is my daughter's favorite mover, because he is Warehouse Mouse's best friend. Our favorite song is "Whats your favorite Snack?". My son's favorite is warehouse mouse!! My boys like Rich because he plays the drums. Our favorite song is "Shakable You." Love shaking everything and dancing crazy to it! "Shakable You" is one of our favorites. We can't help but move. Mover Smitty is my son's favorite!! My sons favorite song is the Boom Boom Song! Smitty is our favorite Mover! "The Last Song" is our favorite! My son's loves Mover Rich! My son loves the song "Seven days a week"
My daughter is loves Warehouse mouse and Smitty. She thinks Warehouse mouse is so silly! In my house we love the theme song to the show. My daughter and I both find ourselves singing it! Smitty is my daughter's favorite and Scott is my son's!!! Our favorite song is the end song! We get up and dance every time! "7 Days a Week" is our favorite! Thanks for the giveaway! My daughter loves Scott the best. We like their theme song the best. my son's favorite is rich. Mover Smitty is my sons favorite Mover! Mover Dave is our favorite.